Why is it so important to have an eye exam at 6 months of age? There are so few people taking advantage of the great InfantSEE program that offers free eye exams for children age 6 months to 12 months, but the conditions that can be found during this exam can influence a lifetime. During the exam your optometrist will be able to find life and vision threatening tumors, large prescriptions or eye muscle anomalies that could result in severe eye turns or vision loss, and congenital conditions that can result in permanent blindness and be associated with serious systemic health issues. Yes, all that is what is taking place at your eye examination. It is so much more than "which is better, 1 or 2." 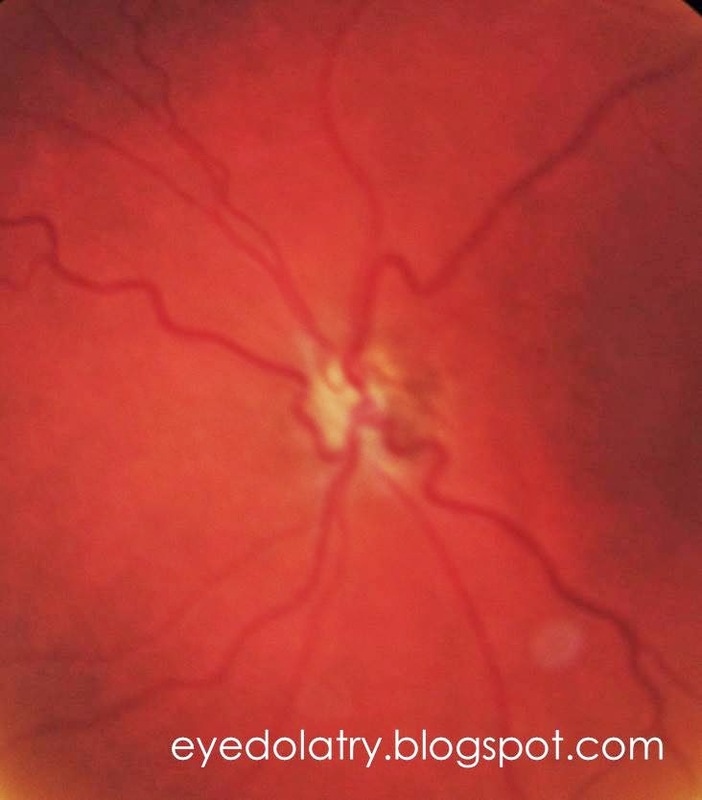 In this photograph there is one structure that is nearly missing -- the optic nerve!! This is a great example of optic nerve hypoplasia -- basically an under-developed optic nerve. This structural anomaly would be present from birth, and typically occurs in both eyes (about 80% of the time). Vision is typically quite bad out of an eye with this condition -- the nerve tissue is malformed so there will be very poor transmission of the visual message from the eye to the brain. Unfortunately, there is no treatment for reduced vision due to optic nerve hypoplasia. Since the nerve didn't develop properly before birth, there is no way at this time to regenerate the undeveloped or malformed nerve tissues. If you or a family member has been diagnosed with optic nerve hypoplasia, there are some associated systemic conditions that also need to be investigated. De Morsier syndrome is the most commonly associated -- where brain malformations may also exist in addition to the malformed nerve. MRI imaging is typically done early on in the diagnosis to detect structural damage to other parts of the brain. Optic nerve hypoplasia is also associated with malformations in the pituitary gland and hypothalamus, which can result in hypothyroidism, growth hormone issues, and diabetes insipidus.